Add a passenger backrest to your Roadstar cruiser for comfort and style. Yamaha passenger backrests are a three piece mix and match system made up of side arms, the upright and a pad. There's lots of flexibility, get exactly what you need for the perfect backrest. The following accessories fit 1999-2009 Roadstar and Roadstar/Silverado. 1) Backrest side arms mount to the rear fender and provide a base to attach the upright sissy bar. Side arms allow for a permanent or quick release upright. Deluxe side arms mean your upright is always attached. Quick release side arms allow for a conveniently removable easy on, easy off upright. Our studded 2001 Roadstar picture includes deluxe side arms, a deluxe tall upright and a custom leather studded backrest pad. 2) The backrest upright or sissy bar is the chrome bar itself, it comes in low or tall. A low deluxe upright or a low quick release upright sits snug at seat level. A deluxe tall upright or tall quick release upright provides mid-back support. 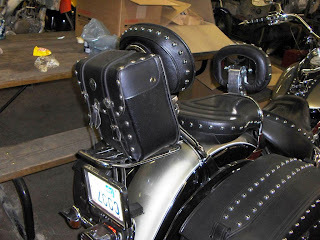 3) Backrest pads mount on the upright and come in 3 styles deluxe vinyl, custom leather or custom leather with studs. See and buy Roadliner parts on our microfiche pages.